Nanoengineers at the University of California San Diego [UCSD], in collaboration with the Materials Project at Lawrence Berkeley National Laboratory (Berkeley Lab), have created the world’s largest database of elemental crystal surfaces and shapes to date. Dubbed Crystalium, this new open-source database can help researchers design new materials for technologies in which surfaces and interfaces play an important role, such as fuel cells, catalytic converters in cars, computer microchips, nanomaterials and solid-state batteries. The work, published Sept. 13  in the journal Scientific Data, provides the surface energies and equilibrium crystal shapes of more than 100 polymorphs of 72 elements in the periodic table. Surface energy describes the stability of a surface; it is a measure of the excess energy of atoms on the surface relative to those in the bulk material. Knowing surface energies is useful for designing materials that perform their functions primarily on their surfaces, like catalysts and nanoparticles. Also, the surface energy is not just a single number for each crystal because it depends on the crystal’s orientation. “A crystal is a regular arrangement of atoms. When you cut a crystal in different places and at different angles, you expose different facets with unique arrangements of atoms,” explained Ong, who teaches the course NANO106 – Crystallography of Materials at UC San Diego. Here, too, is a link to Crystalium. This entry was posted in nanotechnology, science and tagged Balachandran Radhakrishnan, Berkeley Lab, Crystalium, database of elemental crystal surfaces and shapes, Donald Winston, FireWorks workflow codes, Kristin A. Persson, Kristin Persson, Lawrence Berkeley National Laboratory, Materials Project, Python Materials Genomics library, Richard Tran, Shyue Ping Ong, Surface energies of elemental crystals, UC San Diego, UCSD, University of California San Diego, Wenhao Sun, Zihan Xu on October 11, 2016 by Maryse de la Giroday. Led by Professor Michael J. Sailor, Ph.D., from the University of California San Diego [UC San Diego], the award brings together a multi-disciplinary team of renowned experts in laboratory research, translational investigation and clinical medicine, including Erkki Ruoslahti, M.D., Ph.D. of Sanford-Burnham Medical Research Institute, Sangeeta N. Bhatia, M.D., Ph.D. of Massachusetts Institute of Technology and Clark C. Chen, M.D., Ph.D. of UC San Diego School of Medicine. Ballistics injuries that penetrate the skull have amounted to 18 percent of battlefield wounds sustained by men and women who served in the campaigns in Iraq and Afghanistan, according to the most recent estimate from the Joint Theater Trauma Registry, a compilation of data collected during Operation Iraqi Freedom and Operation Enduring Freedom. “A major contributor to the mortality associated with a penetrating brain injury is the elevated risk of intracranial infection,” said Chen, a neurosurgeon with UC San Diego Health System, noting that projectiles drive contaminated foreign materials into neural tissue. Under normal conditions, the brain is protected from infection by a physiological system called the blood-brain barrier. “Unfortunately, those same natural defense mechanisms make it difficult to get antibiotics to the brain once an infection has taken hold,” said Chen, associate professor and vice-chair of research in the Division of Neurosurgery at UC San Diego School of Medicine. DARPA hopes to meet these challenges with nanotechnology. The agency awarded this grant under its In Vivo Nanoplatforms for Therapeutics program to construct nanoparticles that can find and treat infections and other damage associated with traumatic brain injuries. Several types of nanoparticles have already been approved for clinical use in patients, but none for treatment of trauma or diseases in the brain. This is due in part to the inability of nanoparticle formulations to cross the blood-brain barrier and reach their intended targets. Treating brain infections is becoming more difficult as drug-resistant strains of viruses and bacteria have emerged. Because drug-resistant strains mutate and evolve rapidly, researchers must constantly adjust their approach to treatment. In an attempt to hit this moving target, the team is making their systems modular, so they can be reconfigured “on-the-fly” with the latest therapeutic advances. Nanocomplexes that contain genetic material known as short interfering RNA, or siRNA, developed by Bhatia’s research group at MIT, will be key to this aspect of the team’s approach. “The function of this type of RNA is that it specifically intereferes with processes in a diseased cell. The advantage of RNA therapies are that they can be quickly and easily modified when a new disease target emerges,” said Bhatia, a bioengineering professor at MIT and partner in the research. But effective delivery of siRNA-based therapeutics in the body has proven to be a challenge because the negative charge and chemical structure of naked siRNA makes it very unstable in the body and it has difficulty crossing into diseased cells. To solve these problems, Bhatia has developed nanoparticles that form a protective coating around siRNA. “The nanocomplexes we are developing shield the negative charge of RNA and protect it from nucleases that would normally destroy it. Adding Erkki’s tissue homing and cell-penetrating peptides allows the nanocomplex to transport deep into tissue and enter the diseased cells,” she said. Bhatia has previously used the cell-penetrating nanocomplex to deliver siRNA to a tumor cell and shut down its protein production machinery. Although her group’s effort has focused on cancer, the team is now going after two other hard-to-treat cell types: drug-resistant bacteria and inflammatory cells in the brain. BTW, the term ‘warfighters’ is new to me; are we replacing the word ‘soldier’? Disease limits soldier readiness and creates healthcare costs and logistics burdens. Diagnosing and treating disease faster can help limit its impact. [emphasis mine] Current technologies and products for diagnosing disease are principally relegated to in vitro (in the lab) medical devices, which are often expensive, bulky and fragile. 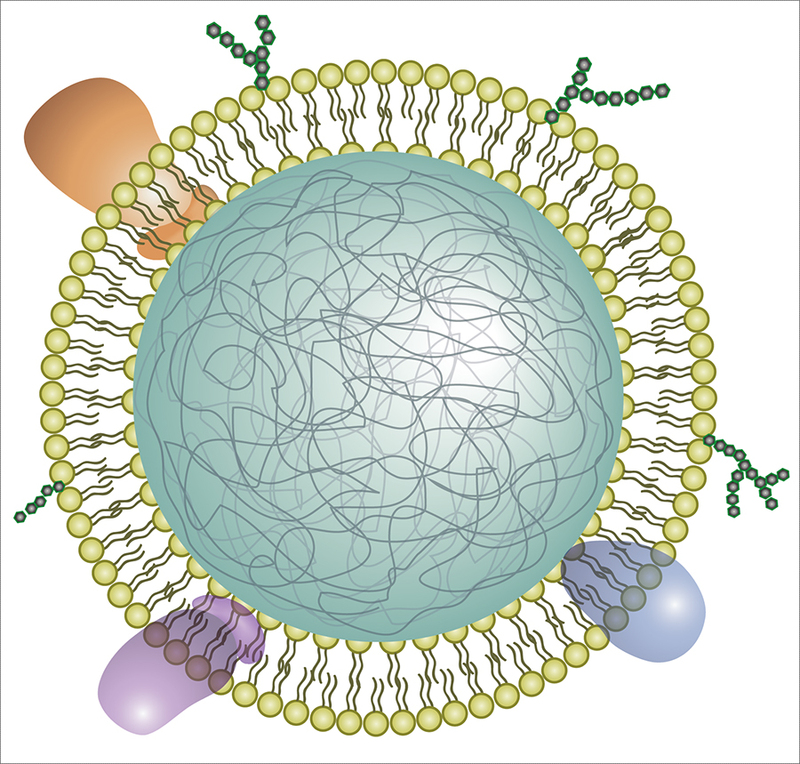 DARPA’s In Vivo Nanoplatforms (IVN) program seeks to develop new classes of adaptable nanoparticles for persistent, distributed, unobtrusive physiologic and environmental sensing as well as the treatment of physiologic abnormalities, illness and infectious disease. The IVN Therapeutics (IVN:Tx) program effort will seek unobtrusive nanoplatforms for rapidly treating disease in warfighters. Northwestern University scientist Chad A. Mirkin, a world-renowned leader in nanotechnology research and its application, has been named 2013 Chemistry World Entrepreneur of the Year by the Royal Society of Chemistry (RSC). The award recognizes an individual’s contribution to the commercialization of research. I’m never quite sure what to make of researchers who receive public funding then patent and license the results of that research. Getting back to soldiers/warfighters, I’m glad to see this research being pursued. Years ago, a physician mentioned to me that soldiers in Iraq were surviving injuries that would have killed them in previous conflicts. The problem is that the same protective gear which insulates soldiers against many injuries makes them vulnerable to abusive head trauma (same principle as ‘shaken baby syndrome’). For example, imagine having a high velocity bullet hit your helmet. You’re protected from the bullet but the impact shakes your head so violently, your brain is injured. This entry was posted in medicine, military, nanotechnology and tagged 2013 Chemistry World Entrepreneur of the Year, Chad Mirkin, Chemistry World Entrepreneur of the Year, Clark C. Chen, DARPA, Erkki Ruoslahti, In Vivo Nanoplatforms for Therapeutics program, IVN, IVN Diagnostics, IVN:Dx, Massachusetts Institute of Technology, Michael J. Sailor, MIT, Northwestern University, Royal Society of Chemistry, RSC, Sangeeta N. Bhatia, short interfering RNA, siRNA, SNAs, spherical nucleic acids, Susan Brown, UC San Diego, University of California San Diego, US Defense Advanced Research Projects Agency on May 10, 2013 by Maryse de la Giroday. In general, one thinks of surveillance as an activity undertaken by the military or the police or some other arm of the state (a spy agency of some kind). The Nano Hummingbird, a drone from AeroVironment designed for the US Pentagon, would fit into any or all of those categories. AV [AeroVironment] is developing the Nano Air Vehicle (NAV) under a DARPA sponsored research contract to develop a new class of air vehicle systems capable of indoor and outdoor operation. Employing biological mimicry at an extremely small scale, this unconventional aircraft could someday provide new reconnaissance and surveillance capabilities in urban environments. The Nano Hummingbird could be described as a traditional form surveillance as could the EyeSwipe iris scanners (mentioned in my Dec. 10, 2010 posting). The EyeSwipe allows the police, military, or other state agencies to track you with cameras that scan your retinas (they’ve had trials of this technology in Mexico). It not only removes the frustration, it removes at least some of the impetus for creativity. The service is being framed as a convenience. Coincidentally, it makes much easier for marketers or any one or any agency to track your activities. A team of U.S. scientists has designed some new men’s briefs that may be comfortable, durable and even stylish but, unlike most underpants, may be able to save lives. “This specific project involves monitoring the injury of soldiers during battlefield surgery and the goal is to develop minimally invasive sensors that can locate, in the field, and identify the type of injury,” Wang told Reuters Television. I realize that efforts such as the ‘smart underpants’ are developed with good intentions but if the data can be used to monitor your health status, it can be used to monitor you for other reasons. That sure takes the discovery/excitement aspect out of getting to know someone. As I noted with my comments about Percolate, with more of our lives being mediated by applications of this nature, the easier we are to track. The big potential benefit of users having to attach real identities to their Internet personas is more constructive dialogue. The downside, though, is that true whistle-blowers will lose one of their most essential tools. Though today’s journalists often grant establishment sources anonymity to attack weaker critics, anonymity’s real social value is rooted in helping the powerless challenge the powerful. Think WikiLeaks, which exemplifies how online anonymity provides insiders the cover they need to publish critical information without fear of retribution. Eliminating such cover will almost certainly reduce the kind of leaks that let the public occasionally see inconvenient truths. One week ago, my entire Google account was deactivated suddenly and without warning. I was not allowed to access gmail nor any other Google service until I surrendered my personal telephone number in exchange for reinstating access to my gmail account. I still cannot access many of my other accounts, such as Google+, Reader and Buzz. My YouTube account remains locked, too. My name is a pseudonym, as I openly state on my profile. I have used GrrlScientist as my pseudonym since 2000 and it has a long track record. I have given public lectures in several countries, received mail in two countries, signed contracts, received monetary payments, published in a number of venues and been interviewed for news stories – all using my pseudonym. A recent Google search shows that GrrlScientist, as spelled, is unique in the world. This meets at least two of your stated requirements; (1) I am not impersonating anyone and (2) my name represents just one person. GrrlScientist is not the only writer who prefers a pseudonym. Mark Twain did too. His real name was Samuel J. Clemens but widely known as Mark Twain, he was the author of The Adventures of Tom Sawyer, Adventures of Huckleberry Finn, and many more books, short stories, and essays. Minimzing bullying, ensuring civility, monitoring vital signs in battle situations, encouraging people to write, helping a friend stay on diet are laudable intentions but all of this leads to more data being collected about us and the potential for abusive use of this data. This entry was posted in military, nanotechnology, science and tagged AeroVironment, Austin Carr, biosensors, Christine Peterson, DARPA, David Sirota, Defense Advanced Research Projects Agency, Eric Schmidt, EyeSwipe Mini, EyeSwipe Nano, Foodzy, Foresight Institute, GrrlScientist, Joseph Wang, Marjolijn Kamphuis, Mark Twain, Morgan Clendaniel, Nano Hummingbird, Nic Fleming, Percolate, Randi Zuckeberg, Samuel J. Clemens, smart underpants, Smartphone surveillance: The cop in your pocket, smartphones, surveillance, University of California San Diego, whistleblowing on August 12, 2011 by Maryse de la Giroday.